It is useful that these tools are all contained in a closed case – especially for younger grades. 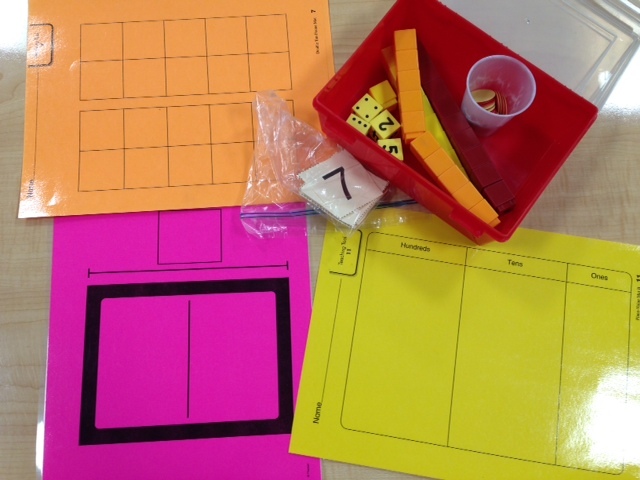 Using manipulatives is a great way for the younger grades to experience math through the other senses. Your CT has created an environment where they are encouraged and used regularly. I’ve talked to other cohort members whose teachers do not used manipulatives very often as they are afraid students will play with them and that they will become a distraction versus a learning tool. Students are so kinesthetic at the younger grades though. I find our third graders still want to hold the tools and use them regularly as a way to relate to the subject and more deeply understand the concept. I agree with you, that is a great tool kit for a classroom. The boxes come from Lakeshore Learning and seem easy enough to open for the first graders and yet never seem to accidentally come open. She did a great job at the beginning of the year of letting them explore everything in the box for a few minutes, then explaining what everything is, and then giving the expectation that they are to use for math not for toys. She has bins of extras that students can play with during choice time at the end of the day. We also like that we can easily see what the students are thinking / building / doing with the manipulatives as we walk around the room.